Description: Listen closely. You can almost hear the soft whisper of the pine branches as they dance in the wind through this magnificent creation combining custom lighting and fan technologies. 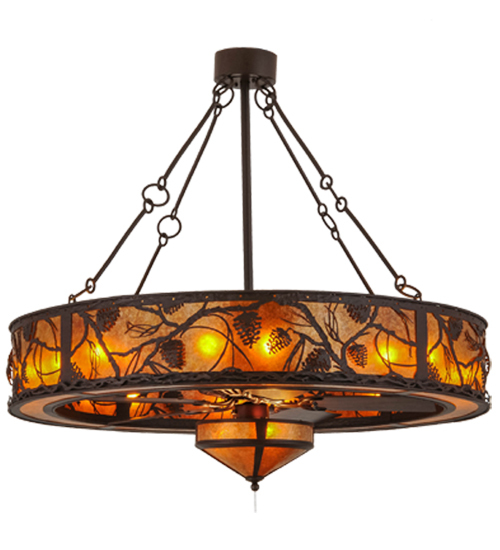 Enjoy the warm ambiance of beautiful light diffused through Amber Mica featuring stunning pinecone and pine branch designs, with a matching fan light below the fan. Whether you call it a Chandel-Air or a Fan-de-Light to benefit from the gentle breezes produced from the 40 inch Fan spinning quietly in the center. The fixture is featured in a handsome Cafe Noir finish and handcrafted by Meyda artisans in Yorkville, New York. Custom sizes, styles and colors are available, as well as dimmable energy efficient lamping options.